About: The Cobden Arms serve traditional pub meals at lunch and a selection of Thai dishes in the evenings. Catering for private parties is available and guests are requested to phone in advance. Sky TV is also available. Speed of service. Either get more staff or go on a hospitality course. The foods fantastic but sitting for 30 mins and being served after people who have clearly walked through the door...dire. not going to eat there or recommend to anyone. In fact I recommend people avoid it like ebola. 3- Decide what the place is a pub or a pub which mainly caters for tourists who want to eat? I'm a resident of Camden. Been one for three years now. That's not long, but it's long enough to get tired of the sweaty crowds and the impossibility of "just having a pint". I reluctantly write this review, because I don't want to see this place mobbed by throngs of tourists, but it's my new favourite place. Reasonable Irish dècor with peculiar touches of modern art, it's a good place to have a drink with enough room to spread yourself out on a Friday night without getting your feet stepped on. And at £3.90 for a pint of Becks, the price is definitely right. I have to agree, the atmosphere here has the feel of a friendly village pub and the food is tasty, generous and reasonably priced. Drinks were served promptly in clean glasses, a rarity in London! We were lucky to stumble upon this place on a night when the musicians were playing and this only added to the excellent ambience. Hard to believe it`s in the middle of the madness of Camden! More like this please! Go for the Thai food it is fantastic, beer's not bad either. Well kept beer, good atomsphere, best Thai food in London. Great atmosphere,SUBERB thai food!! Well worth a visit. Wicked pub (just revamped inside), great beer (as good a pint as you'll get in London), friendly crowd (for London) and superb Thai food in the evening (best I've eaten outside of Bangkok) ! What a brilliant little gem! This place is like a home from home - the landlady is a legend - Homemade Stew and Wheaten with Limerick Ham for free on St Pats! The sessions are always class, and the Magners and Guinness taste like you were back across the Irish Sea. The Thai food is brill, and really inexpensive for what you get! The Cobden is a nice and friendly local pub which serves really yummy Thai food at a great price (£5 gets you a pad thai that should fill most people). It's rare to find a place so homey and warm to escape from the hustle and bustle of this busy high street. This is a good pub. They serve good food. 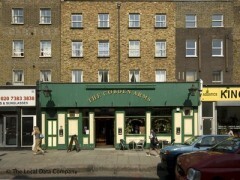 Go to the Cobden Arms. Tell them, "Bob sent me."